warnings Archives - BetterByDesign Nutrition Ltd.
Are Low Carbohydrate Diets Linked to Risk of Premature Death? For a second week in a row dire warnings about the alleged dangers of “low carbohydrate diets” scream out from headlines across the internet. The general public relies on journalists to thoroughly research their stories before publishing them however in the above two examples and the other incidences of reporting this story it was not indicated that (1) there was no published study (2) the story was based on researcher’s conclusions in provided materials based on an Abstract from a Poster presentation and (3) the provided materials / Abstract didn’t define the term “low carbohydrate” (# of grams of carbohydrate per day) which is central to the claims of the researchers. 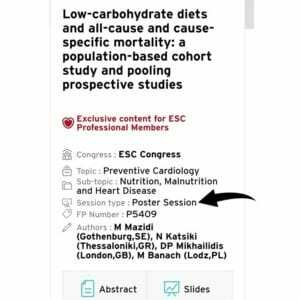 The supposed link to “premature death” of a “low carbohydrate diet” were said to be part of a large study that was presented at the European Society of Cardiology (ESC) Congress 2018 in Munich, Germany, but when I went to find the journal in which the study was published so I could read it, I discovered that it’s not even been published yet. I even checked the lead author’s Publication page on ResearchGate and could not find the published study. Furthermore, the findings were not presented as one of the more than 500 Conference sessions of research studies at the European Society of Cardiology Congress, but was one of the 4,500 Abstract presentations — not even as a talk, but as a Poster Session. 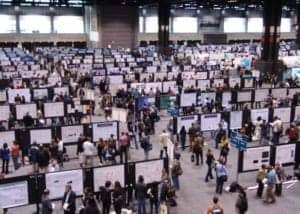 A “Poster Session” at an academic Conference is where 100s of researchers assemble in a large hall and stand in front of a poster summarizing their research. People walk by, look at the poster and if they wish, ask questions. Journalists wrote stories based on “materials provided to them by the European Society of Cardiology” (see story source at bottom of ScienceDaily article) which is based on the Abstract available on the website of the European Society of Cardiology’s 2018 Congress from the yet-to-be-published study by M. Mazidi (Gothenburg, Sweden), N Katsiki (Thessaloniki, Greece), DP Mikhailidis (London, Great Britain) and M Banach (Lodz, Poland) and also published the same day (August 28, 2018) in the European Heart Journal, Volume 39 Supplemental on pages 1112-1113. The Abstract (viewable below) is downloadable from the journal’s website and the 2018 Congress website and clearly indicates that it was a “Poster Session”. A glaring omission from the Abstract is that it is not stated anywhere how many grams of carbohydrate per day is defined as a “low carbohydrate diet”. The Abstract and supplied press materials claim that there is a relationship between “low carbohydrate diets” (not defined!) and death from all-causes, as well as specific death from coronary heart disease, cerebrovascular disease (stroke) and cancer and that the data analyzed was based on a representative sample of 24,825 participants of the US National Health and Nutrition Examination Survey (NHANES) from 1999 to 2010. The researchers conclude that compared to participants with the highest carbohydrate consumption (also not defined! ), those with the lowest carbohydrate intake had a 32% higher risk of all-cause death during the ~6.4-year follow-up. As well, the risk of death from coronary heart disease from “low carbohydrate”diets was 51% higher, from cerebrovascular disease (stroke) was 50% higher and from cancer was 35% higher. They furthermore state that their results were confirmed by a pooled meta-analysis of 7 prospective cohort studies with 447,506 participants and which had an average follow-up of 15.6 years which indicated that risk of death from all causes resulting from “low carbohydrate diets” was 15% higher, from cardiovascular disease was 13% higher and from cancer was 8% higher compared to high carbohydrate diets. 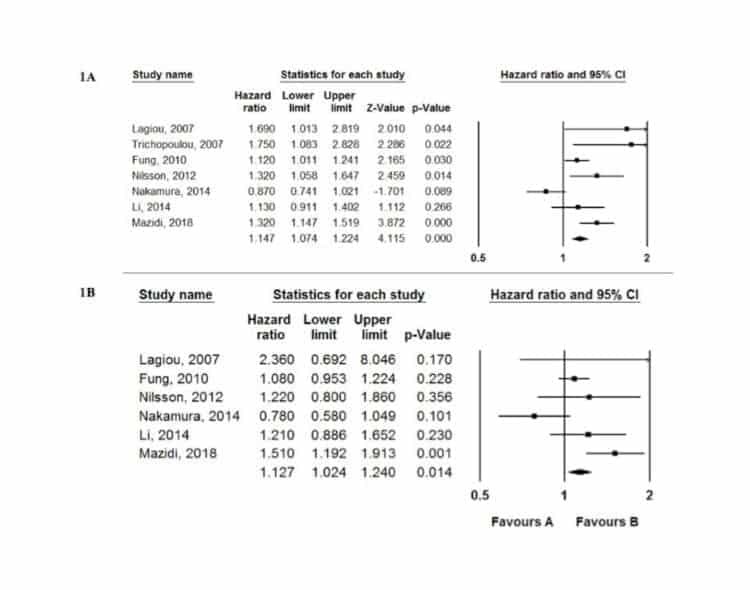 The researchers found risk of death from coronary heart disease and cardiovascular disease (heart attack and stroke) as ~50% higher and the pooled data of the studies they compared it to found a 13% higher incidence. Even without defining what a “low carbohydrate diet” is, a 50% increased chance of death is not comparable to a 13% increased chance of death. Similarly, the researchers found risk of death from cancer from a “low carbohydrate diet” was 35% greater and said their findings were comparable to an 8% higher incidence in the pooled data. The researchers (1) did not define how many grams of carbohydrate per day was considered a “low carbohydrate diet” and (2) said their data was confirmed by studies that reported very different results. Our study highlighted the unfavorable effect of low carbohydrate diets (LCDs) on total- and cause- specific mortality, based on both individual data and by pooling previous cohort studies. Given the fact that LCDs may be unsafe, it would be preferable not to currently recommend these diets. Further studies to clarify the mechanisms involved in these associations and to support our findings are eagerly awaited. Which “low carbohydrate diet” did they study? How many grams of carbohydrate per day? We don’t know because the Abstract doesn’t say and the study hasn’t yet been published. It is not responsible journalism for the media to scream headlines warning of higher risk of premature death from “low carbohydrate diets” based on supplied press materials and an Abstract of a Poster Session of an unpublished study that doesn’t even define “low carb”. 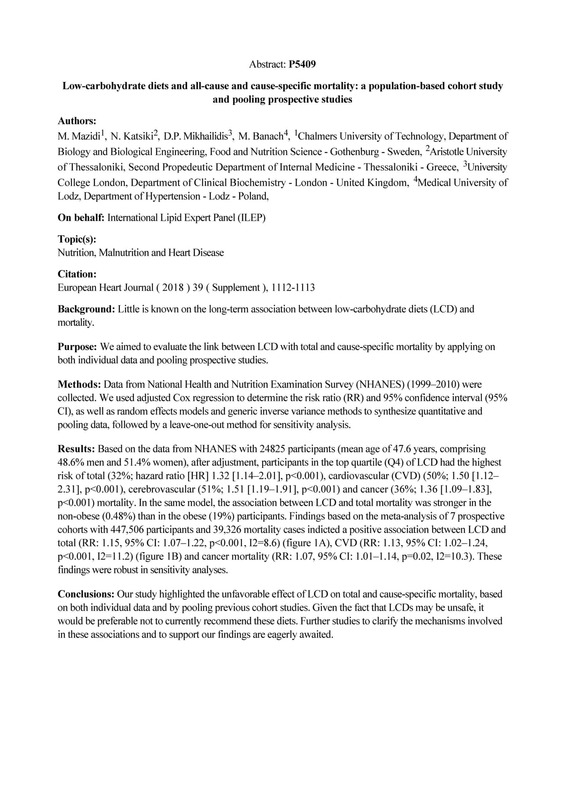 There are many studies and meta-analyses using a low-carbohydrate or ketogenic dietary intervention that span 18 years and that are outlined in detail in 76 publications involving 6,786 subjects and that include 32 studies of 6 months or longer and 6 studies of 2 years or longer that demonstrate that low carb diets of a specified number of grams of carbohydrate per day are both safe and effective. You can read more about that here. Perhaps you have questions such as is a low-carbohydrate diet appropriate for you given your health goals, medical conditions or medications you are taking? Please feel free to send me a note using the “Contact Me” form and I will reply as soon as possible. I provide both in-person services in my Coquitlam (British Columbia) office as well as Distance Consultation services (via Skype / long distance phone) and I’d be happy to help you achieve your health and nutrition goals. Mazidi M, Katsiki N, Mikhailidis DP et al, Abstract (P5409): Low carbohydrate diets and all-cause and cause-specific mortality: a population based cohort study and pooling prospective studies, European Heart Journal, Volume 39 (Supplemental), pages 1112-1113. INTRODUCTION: Diabetes Australia, the national body responsible for making treatment and dietary recommendations for the 1.7 million people living with Diabetes in that country has just released a new Position Statement titled Low Carbohydrate Eating for People with Diabetes  said to be based on the latest evidence on the subject. The publication is designed to provide practical advice and information for people diagnosed with Diabetes who are considering adopting a low carbohydrate eating plan and was created in response to numerous inquiries from individuals, healthcare professionals and the general public, Diabetes Australia. Since I don’t provide dietary to support to those with Type 1 Diabetes (but defer instead to someone with CDE credentials), I have limited my discussion to recommendations pertaining only to Type 2 Diabetes. Diabetes Australia defines low carbohydrate (“low carb”) eating patterns as those that restrict carbohydrate intake — especially processed and packaged foods and beverages including cakes, candies, chocolate, chips, ice cream and sugary drinks as well as breads, cereals, grains, potatoes, fruit and sugar. They elaborate that when people are limiting carbohydrates they eat a higher proportion of protein and fats such as those found in meat, chicken, eggs, oily fish, avocados, nuts, oils and butter and eat plenty of low carb vegetables, such as cauliflower and zucchini. The publication makes clear that Diabetes Australia “does not promote or encourage any single diet or eating plan or any particular ‘diabetes diet'” and that “every person with Diabetes needs a personalized approach and support to have the healthiest eating plan and this may change over their lifetime with Diabetes“. They mention that in recent years, low carb eating has gained popularity with the general population and has also gained interest for people with Diabetes as “an option to help lose weight and to assist in managing blood glucose levels” — because “low carb diets are relatively easy to follow”. In formulating their Position Statement, the organization states that they rely on “strong scientific evidence before making specific health and nutrition recommendations for people with diabetes or those at risk” and that “evidence is usually based on the National Health and Medical Research Council (NHMRC) hierarchy of evidence” whose components are; 1. The evidence base, in terms of the number of studies, level of evidence and quality of studies (risk of bias), 2. The consistency of the study results, 3. The potential clinical impact of the proposed recommendation, 4. The generalisability of the body of evidence to the target population for the guideline, and 5. The applicability of the body of evidence to the Australian healthcare context. This hierarchy of evidence is said to also need to take into account “the quality of the study and the likelihood that the results have been affected by bias during its conduct; the consistency of its findings to those from other studies; the clinical impact of its results; the generalisability of the results to the population for whom the guideline is intended; and the applicability of the results to the Australian (and/or local) health care setting”. “People with Diabetes should make their own, informed choices about their Diabetes management (including eating plans) in consultation with their diabetes healthcare team”. They recognize that “long-term studies can take years to be designed, conducted and published” and underscore that they will continue to review and update their advice in relation to low carb eating for people with Diabetes based on new evidence as it becomes available. Based on two studies [3,4] the report states that “recent evidence has shown that in the short term (up to 6 months), lower carb eating can help with the management of Type 2 Diabetes but that this benefit is no longer evident after 12 months”. (a) Both of the studies quoted [3,4] were not low carb studies but moderate carb studies of <45% (225g carbohydrate) per day. Low carbohydrate diets as defined by this paper are diets which provide “less than 130 g of carbohydrate daily/ less than 26% of total daily energy intake” and the paper defines a moderate carbohydrate diet as one that provides “130g–225g of carbohydrate daily/ 26%–45% of total daily energy intake”. The two quoted studies provided dietary intake of carbohydrate that were moderate carbohydrate. Neither was a low carbohydrate study. (b) Interestingly, despite neither study being low carb, one of the quoted studies  found “greater weight loss at 12 months on moderate carb diets than high carb diets” — which contradicts that there was no benefit after 6 months. Even a moderate-high carb diet had benefit beyond 6 months when compared with a high carb diet! (c) In addition, the position statement did not consider the recent publication of the 1-year study results from Virta Health  outlined in detail in this article. In addition to promoting weight-loss, reducing carbohydrate intake can provide health benefits that include lowered average blood glucose levels and reduced risk of heart disease such as raised cholesterol and raised blood pressure and that some benefits can be achieved independent of the amount of weight-loss achieved. do so in consultation with their Diabetes healthcare team. personalized advice from an Dietitian experienced in Diabetes management as there are some practical considerations that need to be taken into account to ensure the eating plan is safe and enjoyable, provides adequate nutrition for general health, is culturally appropriate and fits into the person’s lifestyle. advice from their health care team if concerned. with kidney or liver failure, or those with a history of disordered eating or some rare metabolic conditions. All people who choose to follow a low carb eating plan should be encouraged to eat foods proven to be beneficial to good health, including whole fruit and vegetables, whole-grains*, dairy foods, nuts, legumes*, seafood, fresh meat and eggs. All people should be encouraged to limit their intake of foods that are high in energy*, carbohydrate or salt*, including processed foods such as sugary drinks, chips, cakes, biscuits, pastries and candies. [NOTE: Unfortunately, foods that are ‘high in energy’ or ‘high in salt’ are inadequately defined in this publication. “High in energy” would be better framed as “low nutrient density foods” — which are foods high in energy relative to the amount of nutrients they contain. Cheese for example may be energy-dense per 100 g but is also very nutrient-dense. What does “high in salt” means — high in salt for whom? Perhaps you have questions as to how I could help you get started on eating low carb to lower your blood sugars, reverse symptoms of Type 2 Diabetes, reduce your risk of heart disease including raised cholesterol and blood pressure and lose weight? Since I provide services both in-person in my Coquitlam (British Columbia) office as well as via Distance Consultation (Skype or phone), I am available to help. Please send me a note using the Contact Me form above and I will reply as soon as I am able.